When the CBR team talked on Facebook about highlighting Canadian books for Canada Day, I went down a rabbit hole with some of the CanLit on my bookshelves. I have been mired in a Brandon Sanderson behemoth, but decided to quickly write up a review of one that I could both reread relatively quickly and hadn’t read in some time. I sat there, and Unless was right in front of my eyes, having been untouched for probably ten years. So here we are. The interesting thing about growing up Canadian in the 80s is how much disdain I generally felt for all things Canadian. I thought that Canada was lame, that the USA was where everything cool and fresh came from, and I could not wait to get out of my small Canadian town and go to NYC. When I went to university in the 90s, I think that there was something of a cultural Canadian renaissance, where Canadian cultural success was more obvious and valued throughout the world as well as in my home country. This may just be my feelings about this – I had moved to a bigger city, was exposed to different people and ideas and media, and everything just seemed more interesting, including Canadian culture. Don McKellar, Sandra Oh, Sarah Polley, Rohinton Mistry, Anne Michaels, Ken Wiwa, The Tragically Hip, 54-40, Bran Van 3000 – Canadian culture seemed both very accessible and important to me. I think I maybe came to Canadian culture later than I should have, but once there, I was all in. Unless is the worry word of the English language. It flies like a moth about the ear, you hardly hear it, and yet everything depends on its breathy presence… Unless you’re lucky, unless you’re healthy, fertile, unless you’re loved and fed, unless you’re clear about your sexual direction, unless you’re offered what others are offered, you go down into darkness, down to despair. Unless provides you with a trapdoor, a tunnel into the light, the reverse side of not enough. Unless keeps you from drowning in the presiding arrangements. 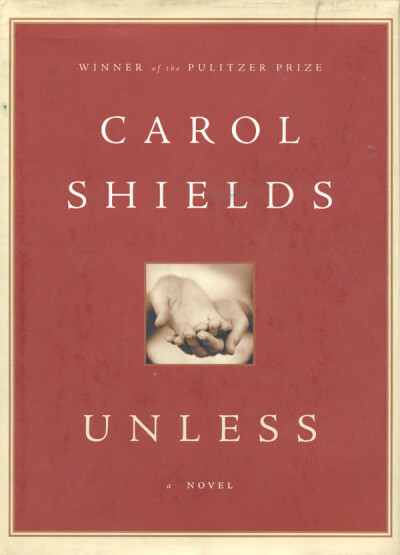 Carol Shields was one of the most famous Canadian authors, having won the Pulitzer Prize and the Governor’s General Award for The Stone Diaries in the early 90s. She was a delightful woman, supporting other women authors and having a distinctive Canadian voice. I love all her books, although I love Larry’s Party most of all for some reason. I think by the time Unless was about to be published we knew she was dying of breast cancer, and I bought it as soon as it was released. I can remember reading this relatively short book quickly, and having been a little disturbed by it as well as frustrated. I remember that the main character had a daughter who inexplicably began living on the street, begging with a sign around her neck that reads “GOODNESS.” I remember being a bit frustrated about never knowing WHY this girl chooses this life, and thinking that the book was unfocused and slow and never really got to the meat of the story, and was so surprised. However, once I started rereading it this weekend, I realized I was maybe too naive and rushed and totally missed the point of this novel. Our protagonist is a writer and translator, living a comfortable life with her husband and three wonderful daughters. When the oldest daughter Norah inexplicably chooses to live a life of abnegation on the street, Reta Winters is just thrown for a loop. She struggles to understand why Norah would have made that choice – when I read this the first time, I was also desperate to know why and assumed that the book would centre on this mystery. I still want to know why with this second reading, but better understand that Shields is using Norah’s mysterious choice to explore other things. When something tragic has happened to me (or people I love), I am always left wondering how people can go about living their lives as if nothing had happened when obviously this grief has shaken the very world to the core. [Danielle Westerman] believes that Norah has simply succumbed to the traditional refuge of women without power; she has accepted in its stead complete powerlessness, total passivity, a kind of impotent piety. In doing nothing, she has claimed everything. Reta is left to examine the foundations of her life – what books and writing mean to her; what it means to be a woman with the series of indignities, big and small, visited upon women daily; what indeed is the nature of GOODNESS. Everything seems fragmented – she writes of herself in the third person, describing “Reta” as if she were a costume or maybe as the before-Goodness Reta and the after-Goodness Reta. She starts to reflect more closely on her relationship with Danielle Westerman, a Holocaust survivor and noted feminist whose works Reta has spent years translating from French to English, who has her own strict views on the role of women in the world. I think the loss of Norah, the loss of Reta’s smooth life, is really the framework on which Shields hangs her analysis of feminism through a lens of profound grief. Not one of us was going to get what we wanted. I had suspected this for years, and now I believe that Norah half knows the big female secret of wanting and not getting. Imagine someone writing a play called Death of a Saleswoman. What a joke. We’re so transparently in need of shoring up that we’re asking ourselves questions, endlessly, but not nearly sternly enough. The world isn’t ready for us yet; it hurts me to say that. There is a conversation in the middle of the book, where a group of capable women reflect on how women have been excluded from the conversation, how men so rarely aren’t dying to “win” a conversation, about how hard it is for women to be acknowledged as having the moral authority to centre or even enter the conversation: this entire chapter takes my breath away with anger and recognition. It talks about how women’s literature is treated by the publishing industry and the media, compares the feminism of different eras, and gently shows us the world as it is for half the population. The whole book is like this, and I didn’t realize it all those years ago. I wasn’t ready or experienced enough to realize how angry I should be. I think Unless is maybe one of Shields’ least comfortable books, but it is so much richer than I remember it being. It is very deliberately constructed – each chapter begins with what I think of as a connecting word: thus; insofar as; already. Reta’s fragmented thoughts and life, so desperate to knit it back together or at least understand the why, is part of the structure of the book. I recognize myself here, the same age as Reta, having known tragedy and seeing my place in the world more clearly than ever before. Sitting here writing this last paragraph, two men are on CBC talking about Margaret Atwood. Where are the women to join in this discussion on liberal Canada’s public broadcaster? Why do we force the focus on to Atwood so consistently? Small things, little bits of anger, building up. The CanLit pool is broad and deep. We should talk more about Carol Shields. She is a master and we are poorer for her absence from the world, particularly women, and I am so happy to have had the chance to sink myself in this book again. Share the post "All these years later, I find my anger"
What a beautiful review. I’m so glad Canada Day came around to prompt you to reread this. Me too. I am sorry I sat there so disappointed in this book for so many years, undeservedly. Books have different meanings to us at different times. You have a very different perspective on the world now than you did 10 years ago. Among other things, you are the mother of a daughter and that is bound to change the way you think about feminism and being a woman in the world. What a wonderful review. Thank you! If I wanted to start with some Carol Shields, where should I start? I actually haven’t read it in years, so would be curious to know what you think about it. I remember liking it, but I think I want to reread it now, with more life perspective.